At this very special time of the year, we once again greet you in the Name of our Lord Jesus Christ as we reflect on our awesome God and Father’s goodness and the powerful work of the Holy Spirit we have witnessed here in Zimbabwe. As Mary did, we rejoice in our Lord God and Savior for the amazing works we have seen him perform during this past year and which we know we will continue to see. His mercies are new every morning and he is doing a new thing in our country. Praise God that the swelling in Joan’s foot has gone down and she has been more comfortable with it. Dave is also doing better with the back issues he was experiencing. The problem remains but by monitoring his actions/movements (e.g. not working on the vehicles any longer in awkward positions) he is much like he was previously. He just cannot stand for very long anymore. Praise God for both of them and that we can see his hand of protection and healing on them. In the same way, we are confident that our Lord will heal the hearts of Joan and Craig and their family at the unexpected and sudden loss of Joan’s son (and Craig’s brother), Gary. The void such a loss may leave in our lives can only be filled with the knowledge that our heavenly Father can fill such a void with his compassion and love. The Holy Spirit moved Joan’s heart to start this ministry to children and hungry adults on the streets many years ago. 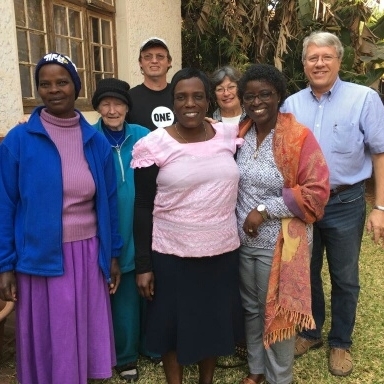 Then by God’s grace, members of Hillsboro Church who were visiting Zimbabwe were deeply touched by her lone ministry, which led to the birth of Home of Hope in 2001. You, the supporters of Home of Hope, have also been hearing the whisper of God’s voice. We can now look back on 17 years of partnership in service of our Lord, overcoming many obstacles yet still standing victorious through him and for him. The ministry has flowed with many twists and turns, just like a lifegiving river in the wilderness. The focus of the ministry still includes assisting children, babies, men and women, schooling, dressmaking, transportation, etc. always with the Word of God at the center of it all. As situations and needs have fluctuated, so this ministry has flowed like a “river” into those areas of need. As God’s Word says in Matthew…seek first God’s Kingdom, because he knows our every need…does he not clothe the flowers of the fields and feed the birds of the air… how much more will he provide for us ….and all the other things will be added unto us!! It was heartwarming to receive a visit from Ebralie Mwizerwa and Frank Dimmock from The Outreach Foundation in August. Their evident love for Jesus and their compassion towards the ministry greatly encouraged and blessed all of the staff at Home of Hope. Cash shortages here hit the dressmaking mothers’ outreach hard. They couldn’t pay for transportation and the Home struggled to find the necessary cash to help them. Initially there were 18 ladies involved but that has dwindled to seven. Some managed to attend only once a month, yet they still managed to learn about design and dressmaking and make their dresses, while also receiving help with food and school for their children. Despite the unavailability of cash, feeding the hungry has continued as we managed to acquire a bank card (debit), not as easy and straight forward as it might seem. The number of people we were feeding had dwindled significantly for some time due to circumstances in our country, but these numbers have increased again to about 120–160 on the day of food distribution. Along with food, we always have basic medicines available and enough money for anyone needing the clinic. Fidelis, who received help for about four years, now stays with his mother and siblings. The Home provides him with a food parcel at the end of each month. He wrote his O-level exams (high school) at the end of this year. He normally ranks about second in his class. However, during the second term he did not perform as well so we helped him with funding for extra tuition (tutoring) during school vacation as he is very trustworthy and hardworking. Thankfully, he improved in three of his subjects. Another one of our boys was praying to be off the streets. God answered his prayers and placed him in a children’s home for which Home of Hope is paying the fees. He is 15 and in seventh grade. Even though he is much older than the children in his class, he is working very hard, getting good grades and determined to obtain his education. He realizes that God has given him this opportunity. We have several others who have had a hard time with family, abuse, and living on the streets with an illness (HIV). By God’s grace, they have survived and Home of Hope is able to provide them with a food parcel at the end of each month and pay for their school fees and uniforms. God’s amazing grace has changed them from wanting to run away from school in the past to now actually loving school. The Lord has moved several off the streets into their own home or relatives’ or foster parent’s homes. We continue to help them with food parcels, school fees and uniforms. Mike is a freshman in high school. He is doing well and is quiet, disciplined, respectable and determined to progress well with his education. He acknowledges that God has blessed him with this opportunity, that God has seen him through very difficult times, and he is thankful. He has a good place to stay, free from abuse. Mike has been receiving help for many years. We also hear from people in the community about the Home of Hope ministry. Joan and Craig met a girl, Rutendo, who works in a supermarket where they shop and they often enjoy friendly chats. Rutendo said she’d been watching Joan and Craig very closely. They appeared different from the regular Christians and she would love to get to know them better and find out what made them different. She was a churchgoer but was surprised that Christians could be so sure they would go to heaven. She wished to know more about the Christian faith. Craig gave her a book on the God of the Bible so that she could learn how we can be sure of our salvation. Craig and Joan also bought her a Bible. She has a job but doesn’t have enough money to provide for the family, a situation she shares with many here in Zimbabwe. Craig and Joan are praying fervently that Rutendo will make the Lord Jesus her Savior and so learn that he is the One who provides for all our needs because he loves us, as his children. Rutendo’s story reminds us once again that people see and know that we are children of the living God because of the way we conduct ourselves in this world, by word and by deed, and God will draw them to himself through us. We continue to pray that this will be the case in all our lives so that we may bring glory to his wonderful and mighty Name. As we stand at the threshold of another Christmas, we rejoice that we have the privilege to belong to him and to be called heirs with Christ. Our prayer is that we will remain ever sensitive to his call in our hearts and be used by him to bring others into his Kingdom of Light. Bless his Holy Name. We wish you all a Christmas season filled with holy reverence and joy because of the knowledge of his mighty, wonderful and beautiful presence with us: IMMANUEL – GOD WITH US!!! Read more about Home of Hope HERE. The Outreach Foundation is seeking $30,000 for the Home of Hope ministry to street people.